This article focuses on buying property for the purpose of making a good investment with a guaranteed or flexible high return. VIP Real Estate Co., Ltd. offers an attractive, flexible and complete investment package for selective real estate projects. You can choose different investment models based on your choice of safety and return of investment. By investing just over 1 million Thai Baht, you can purchase a beautiful apartment located at one of the finest beaches in Thailand. VIP Real Estate has a broad selection of condominiums and houses, fully furnished and equipped, all with very high standards and ready for rental. Furthermore we have several projects under construction. All of our properties are sold at competitive prices with a high potential for increase in value and with good opportunities for rental with a superb location close the the beach. These properties are also easily re-sold. Regardless whether you buy an apartment or a house as a pure investment or as a combination of a holiday house and a good investment, our investment concept offers you a good solution. With these contracts you are able to calculate your guaranteed return of investment, which typically varies from 10.5 % to 20% per year depending on your type of investment and agreement. 1. A rental guarantee of 7% per year of your total investment (property price plus optional furnishing package), and you can use your property yourself for a total of 14 days a year. This contract is valid for two years and is then re-negotiable. 2. A rental guarantee of 6% per year. This contract is valid for five years and is then re-negotiable. You can use your property yourself for a total of 14 days a year. 3. A rental agreement that is fully flexible. You can use your property yourself without any time limit and let us rent it out when you want. In this case there is no guaranteed rental income. It’s up to you to decide. You can of course use your property for more than 14 days per year if you want, even with a guaranteed rental contract, but then the rental return will be reduced accordingly. In general, you can use your property yourself for a total of 14 days during the period from May 1 to September 30 every year. If your property has already been booked in the period you want it, then we will try to assign another property for you. If you want to use your property during the other months (high season in Thailand), it is still possible, but with a reduction in the rental return. Contact us in good time please. With this agreement you can use your property any time you want, provided it is is free (not booked by someone else according to the rental agreement). This type of agreement may get you a higher rental income than the 6% or 7% fixed agreements. The rentals are paid based on the actual rental periods (daily, weekly or monthly). In the table below you can see the net amount of rentals after deductions for commission and service charges. 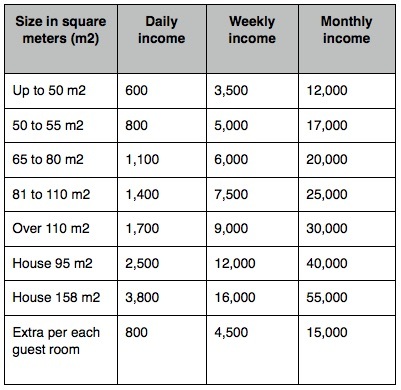 As you can see, the rentals are higher for a period of 160 days per year than the guaranteed rental agreement. A flexible rental agreement is based on 1, 2 or 5 years. During the agreed period, we will inspect the property and take care of all interior maintenance and cleaning without additional costs. The only expense for you is the yearly admission fee to the tenant association. We can pay this on behalf of you and deduct from the rental payments. As the owner you will receive quarterly statements specifying rentals, possible expenses plus a settlement for due balance. For owners with more than three properties we will provide monthly statements. 1. You may expect a higher return of your investment than you can get from bank deposits or pension funds. 2. You have a professional partner, who supervises your property. 3. When you choose to use your property yourself, everything is clean and ready. Just move in and relax and enjoy your holiday. 4. During your stay, you can enjoy the same service and care as in corresponding luxury holiday resorts. 5. We will take care of your property. No worries. 6. We will maintain all inventory free of charge. The figures are in Thai Baht (THB) and based on investment on the properties. The rentals may vary depending on the property location and service facilities.The final amounts will be entered in the contract. The rentals are adjusted every two or three years. When is the right time to buy property in Thailand? Rayong or Hua Hin? Read about the differences.